Plant micropropagation is one of the most classical and widespread biotechnological tools used around the world. Undoubtedly, this technique brought quite important advances to our knowledge about morphological, physiological and developmental patterns of plants, to the progress of genetic breeding and to the establishment of the genetic engineering, among others. This technique is based on the “in vitro farming” of plant fragments in an axenic environment, where all nutrients needed are kindly provided to the cultivated plant, which is maintained under controlled temperature and light-darkness periods. 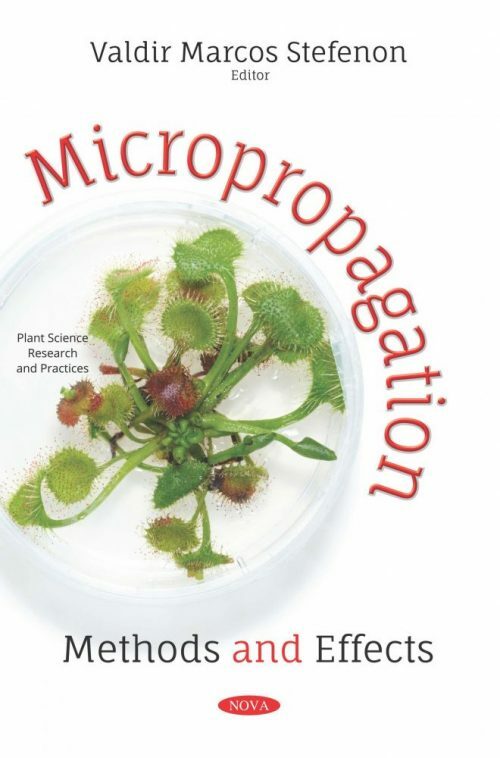 Although it can be considered an established technique, several advances have been integrated to the routines of micropropagation laboratories each year, incorporated to the productive sector and to the academy. In Micropropagation: Methods and Effects, the authors aimed to shortly present some of these advances, as well as practical results of using this biotechnology towards the conservation of plant genetic resources. In seven chapters, methods employed for the micropropagation of different plant species, from agricultural cultures to tree species of the Brazilian Atlantic Forest and advances in techniques for explants disinfection and for analysis of stomata complexes, as well as the progresses related to the micropropagation of apple and the use of bioreactors are presented. The seven chapters of this book will contribute towards incorporating new ideas to the daily effort of each reader, reaching the basic requests of students, professors, researchers and even non-specialized readers.